Whether you're an aspiring popstar or after the perfect Valentine's Day date night activity, Moonlight Cinema, presented by NAB has you sorted this February. On Thursday 7 February, gather your mates for a musical night out with a special sing-a-long screening of Bohemian Rhapsody. Watch the award-winning Queen biopic whilst belting out all your favourite tunes like Don't Stop Me Now, We Will Rock You and Somebody to Love. A truly unmissable experience if you're a fan of incredible films and even better music. If your idea of romance is Ryan Gosling shirtless doing the Dirty Dancing lift with Emma Stone, then Moonlight's Valentine's Day screening of the comedy Crazy, Stupid, Love is the ideal date night flick. So grab your squeeze, pack some bubbly and snuggle down for a romantic evening under the stars. For the perfect Valentine's Day experience, elevate that movie magic and treat yourself to Moonlight Gold Grass tickets. With reserved bean beds in a premium viewing location and wait service, you won't even need to leave your date! 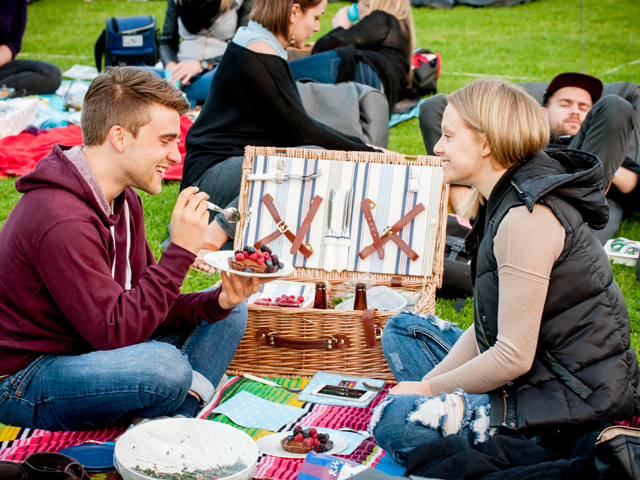 A favourite amongst groups of mates and couples on a hot date, Moonlight Cinema brings the festival atmosphere to film watching. It's more than a movie experience, it's an opportunity to kick back in the outdoors and let the summer of fun roll on. Being a BYO* event, Moonlight makes a night out easy. Prepare a picnic of delicious deli treats or pack your best bottle of bubbly, you can bring it all to Moonlight! Don't have the time to pull together a snack pack for date night? Don't worry, Moonlight Cinema has you covered, their onsite food truck offers up a licensed bar and scrumptious variety of hot food and movie-going morsels to whet the appetite of film fans. **BYO alcohol is not permitted at Brisbane's Moonlight Cinema.